How are we to understand how the dominance of visual images and representations in late modernity affects Social Work practice, research and education? Social workers are increasingly using still and moving images to illustrate their work, to create new knowledge, and to further specific groups’ interests. As a profession in which communication is central, visual practices are becoming ever more significant as they seek to carry out their work with, and for, the marginalised and disenfranchised. It is time for the profession to gain more critical, analytical, and practical knowledge of visual culture and communication, in order to use and create images in accordance with its central principle of social justice. That requires an understanding of them beyond representation. As important as this is, it is also where the profession’s scholarly work in this area has remained and halted, and thus understanding of the work of images in our practices is limited. In order to more fully understand images and their effects – both ideologically and experientially – social workers need to bring to bear other areas of study such as reception studies, visual phenomenology, and the gaze. These other analytical frames enable a consideration not only of images per se, but also of their effect on the viewer, the human spectators, and the subjects at the heart of Social Work. By bringing understandings and experiences in Film, Media, and Communications, Visual Communication for Social Work Practice provides the reader with a wide range of critically analytical frames for practitioners, activists, educators, and researchers as they use and create images. This invites a deeper knowledge and familiarity with the power dimensions of the image, thus aligning with the social justice dimension of Social Work. Examples are provided from cinema, popular media, but more importantly from Social Work practitioners themselves to demonstrate what has already been made possible as they create and use images to further the interpersonal, communal, and justice dimensions of their work. This book will be of interest to scholars, students, and social workers, particularly those with an interest in critical and creative methodologies. 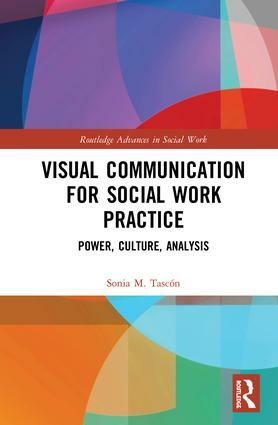 Sonia M. Tascón has been a Social Work practitioner and scholar for over 20 years. As a practitioner, she worked in child protection, community work, clinical and hospital social work. As a scholar, she has published extensively in areas pertinent to Social Work, namely, race and whiteness, ethics, and human rights film and film festivals. Sonia has both a PhD in Social Work, and a PhD in Film Studies.